"Dunkirk" debut: "Dunkirk" won last weekend's battle at the multiplexes, but Hollywood is still losing the summer boxoffice war. The PG-13 rated World War II action drama from Warner Bros., Canal+ and RatPac-Dune Entertainment opened Number One to $50.5 million at 3,720 theatres. "Dunkirk" was the number one film internationally, per comScore, "opening to an outstanding $55.4 million on 10,775 screens in 46 overseas markets for a global combined total of $105.9 million." IMAX, which played a key role in "Dunkirk's" global success, reported Sunday that the film did "nearly $19 million in a stunning performance on 634 IMAX screens in 44 markets. The widest IMAX release ever in North America on 402 screens, "Dunkirk" delivers $11.7 million IMAX boxoffice, a per screen average of almost $30,000, with IMAX screens laying claim to 18 of the Top 20 performing Domestic locations. "Not to be outdone, 232 international IMAX screens yield over $7 million, a powerful per screen average of almost $31,000 and the third highest grossing IMAX opening weekend ever in July, both internationally and globally. "India logs their biggest IMAX opening weekend ever, with the UK enjoying the biggest IMAX opening weekend of 2017 (and third highest 2D opening ever in the country)." 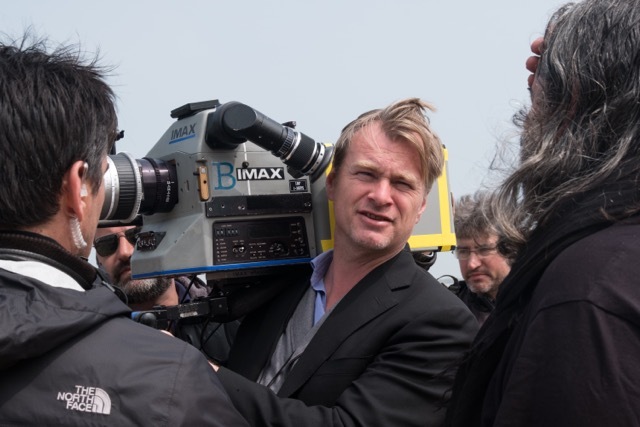 IMAX added that the film was shot "almost entirely with IMAX 70mm film cameras, clearly making iconic IMAX screens with our 15/70mm film projectors the best way to experience the movie. In fact, IMAX film screens are among the highest grossing screens globally, with the IMAX AMC Lincoln Square in New York and the IMAX British Film Institute in London the top performers and virtually sold out all weekend. "This week will see the launch of 'Dunkirk' on another 72 IMAX screens in 24 markets, leaving only Italy (Aug. 31), China (Sept. 1), and Japan (Sept. 9) remaining after this next round of markets." Despite "Dunkirk's" solid domestic launch, comScore's tracking shows the weekend was down about 10 percent versus this time last year and the year to date is 0.7 percent below where it was at this point in 2016. For more details, please see the "Bottom Line" section below. Directed and written by Christopher Nolan ("The Dark Knight" trilogy), "Dunkirk" stars Fionn Whitehead, Damien Bonnard and Aneurin Barnard. The picture reportedly cost about $150 million to produce. Nolan's last feature, the PG-13 rated sci-fi adventure "Interstellar" opened Nov. 7, 2014 to $47.5 million at 3,561 theatres. It did $188 million domestically and $487.1 million internationally. It reportedly cost about $165 million. "Dunkirk" outperformed Hollywood handicappers' expectations of a domestic opening of $35 million to $40 million based on tracking studies. The first sign of a potentially bigger opening came with last Thursday's strong $5.5 million preview gross. Then with Friday total of $19.8 million, "Dunkirk" was clearly on track to do much better than $40 million for three days. The high hopes for "Dunkirk" were fueled not only by the likelihood that Nolan's large fanbase would want to see his latest film, but also by its 92 percent Certified Fresh score on Rotten Tomatoes. We've seen this summer that movies that top the RT Tomatometer tend to over perform at the boxoffice. This trend is mistakenly being explained as moviegoers being influenced by the critics, but that's not exactly what it's about. While RT scores are an aggregate of critical opinions, moviegoers' use of those scores to decide what movies to see is less about their caring what the critics think and more about them wanting an easily understood consumer guide for spending their entertainment dollars. If moviegoers really cared about reviewers' insights into new films, they'd be buying and reading high profile newspapers and magazines or paying to read their reviews online. But that's not what they're looking for. They're not really interested in the art of cinema. What they want to know is whether a film is worth the cost of going to see it? The cost of moviegoing continues to escalate. Just last week the National Association of Theatre Owners reported that in the second quarter the average national movie ticket price hit a record high of $8.95, which was up 2.5 percent from last year. And that's just an average price that's lowered by prices in smaller markets across the country, daytime showings at reduced prices, senior discounts and cheaper tickets designed to fill seats, particularly on Tuesdays. Needless to say, ticket prices are much higher in major markets and for showings in 3D, IMAX and other premium large formats and for theatres boasting the latest in leather recliner seating, gourmet cuisine, cocktail service, etc. All of this makes a pair of tickets or, especially, a family visit to the movies a sizable expense – particularly when you include related costs like transportation, parking, concession stand goodies, dinner before or afterwards and, perhaps, a babysitter if it's a date night for mom and dad. People don't want to waste their money. But they also don't want to take the time to read reviews and figure out what a critic's saying or thinking. They want something that's easy to understand and that can be dealt with in just a few seconds – because today no one has time to spend on anything. So a high Certified Fresh RT score has great value to someone thinking about seeing a movie. Moreover, now that the online movie ticket service Fandango owns RT, those RT scores are right in front of people as they're deciding what to click on to buy tickets. Because it's a very simple number to understand and now it's staring them in the face right at the point of purchase, an RT score can make a big difference. Another encouraging sign for "Dunkirk" last week was that it was looking good on Fandango's Fanticipation moviegoer poll with 90 percent. Fandango said last Thursday that, "'Dunkirk' is outselling the director's sci-fi adventure epic 'Interstellar'...at the same point in the Fandango sales cycle. According to a Fandango survey of more than 1,000 'Dunkirk' moviegoers: 97% want to see the movie on the biggest screen possible; 87% are intrigued by the film's highly visual storytelling; 91% are fans of director Christopher Nolan; 81% are war movie fans; and 77% are fans of costar Tom Hardy." "Dunkirk's" invasion of the multiplexes kicked 20th Century Fox and Chernin Entertainment PG-13 rated sci-fi action adventure "War for the Planet of the Apes" from first to fourth place with $20.4 million, down 64 percent. Its domestic cume is $97.8 million. Second place went to the opening of Universal and Will Packer Productions' R rated comedy "Girls Trip" with $30.4 million at 2,591 theatres. Its 89 percent fresh score on RT had pointed the way to an okay debut. "GT" reportedly cost only $28 million. "GT" also scored well with an 83 percent on Fandango's Fanticipation survey. 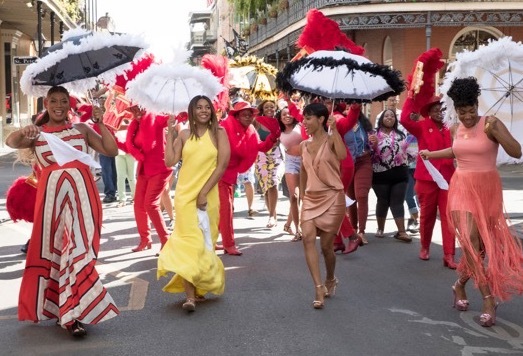 Fandango said that, "of more than 1,000 'Girls Trip' moviegoers: 88% also saw 'Bridesmaids,' 75% viewed 'Pitch Perfect,' 70% watched 'Bad Moms' and 'Magic Mike;' 84% are Queen Latifah fans; 70% are fans of director Malcolm D. Lee's work; and 63% have traveled together with friends on a 'girls trip.'" Last weekend also saw STX and EuropaCorp's PG-13 rated 3D sci-fi adventure "Valerian and the City of a Thousand Planets" open quietly in fifth place to $17 million at 3,553 theatres. That was no surprise given "Valerian's" 54 percent rotten score on RT. Directed by Luc Besson ("Lucy"), it stars Dane DeHaan, Cara Delevingne, Clive Owen and Rihanna. "The film is distributed in the U.S. by STX films on behalf of EuropaCorp," comScore senior media analyst Paul Dergarabedian said Sunday morning. "The film was financed by EuropaCorp for a net cost of approximately $150 million with 90 percent of the budget covered with foreign pre-sales, equity financing and tax subsidies. "The film opens in France on July 26, where, according to the studio, it is tracking toward one of the largest openings of the year. Historically, director Luc Besson's films have performed extremely well internationally and 'Valerian' is expected to do the same." (1) TITLE: "Saving Private Ryan"
NOTES: Despite its R rating, "Ryan" was 1998's top grossing domestic film. The next time an R rated film topped the domestic chart for the year wasn't until 2014 when "American Sniper" did $350.1 million. Steven Spielberg reportedly cast Matt Damon to play Ryan because he wanted to use an unknown actor with an All-American look. But before "Ryan" opened, Damon suddenly became famous by winning an Oscar for co-writing (with Ben Affleck) "Good Will Hunting." Harrison Ford and Mel Gibson reportedly were talked about to play the role of Capt. John Miller that wound up going to Tom Hanks. NOTES: "Pearl" was the seventh biggest grossing film of 2001. Michael Bay and producer Jerry Bruckheimer reportedly helped reduce "Pearl's" big budget by taking percentages of the gross instead of about $4 million in salaries. "Pearl" won the Academy Award for best sounding editing in 2002. To date, it's Bay's only movie to take home an Oscar. (3) TITLE: "Captain America: The First Avenger"
NOTES: "First" was the 12th biggest grossing film of 2011. Chris Evans reportedly said no three times to playing Captain America and Steve Parker because he felt that kind of high profile stardom would wreck his private life. Robert Downey Jr. is said to have changed Evans' mind by telling him how playing the role would then give him the ability to do anything he wanted to do on screen in the future. Although the film's title identifies Captain America as "The First Avenger," he actually wasn't the comic book's first avenger. Ant-Man, Hulk, Iron Man, Thor and Wasp were the first avengers. It wasn't until Hulk left the group that Captain America came on board. NOTES: "IB" ranked 25th on the top grossing domestic chart for 2009. This was Quentin Tarantino's biggest grossing film since "Pulp Fiction" did $107.9 million in 1994. Tarantino reportedly considered casting Leonardo DiCaprio to play Colonel Hans Landa, but decided he needed to cast a German speaking actor in the part and went instead with Christoph Waltz. DiCaprio, however, was cast in Tarantino's next film, the 2012 drama "Django Unchained." Waltz won the Best Supporting Actor Oscar in 2009 for his performance in "IB," making it Tarantino's first film to win an acting Oscar. Waltz also won the Best Supporting Actor Oscar for Tarantino's "Django" in 2013. NOTES: "Unbroken" was the 26th biggest grossing film of 2014. Louis Zamperini, who's played in the movie by Jack O'Connell, died July 2, 2014, about six months before "Unbroken" opened. He did, however, see a rough cut of the film on Angelina Jolie's laptop computer while he was in the hospital. Universal bought the rights to Zamperini's story way back in 1957 and reportedly wanted Tony Curtis to star as the Olympic star who was captured by the Japanese after his plane crashed during World War II. That never happened and the project stayed in limbo until Laura Hillenbrand's book about Zamperini became a best-seller in 2010. Bottom line: Last weekend's domestic ticket sales were about $178 million, per comScore, down about 10.1 percent vs. $198 million a year earlier when "Star Trek Beyond" opened in first place to $59.3 million. 2017 is continuing to erode vs. 2016. In fact, the 2017 lead produced by strong spring ticket sales has now been entirely wiped out. The domestic boxoffice to date this year is $6.576 billion, per comScore, down 0.7 percent vs. $6.620 billion this time last year. Last week, 2017 was down 0.4 percent.